Home Minsitry of Communications Premature closure of RD/TD/MIS accounts - reg. Premature closure of RD/TD/MIS accounts - reg. Sub:- Regarding premature closure of RD/TD/MIS accounts. I am directed to convey the observation of competent authority made during a recent review meeting of Loss & Fraud cases held in Directorate on 27.03.2019. 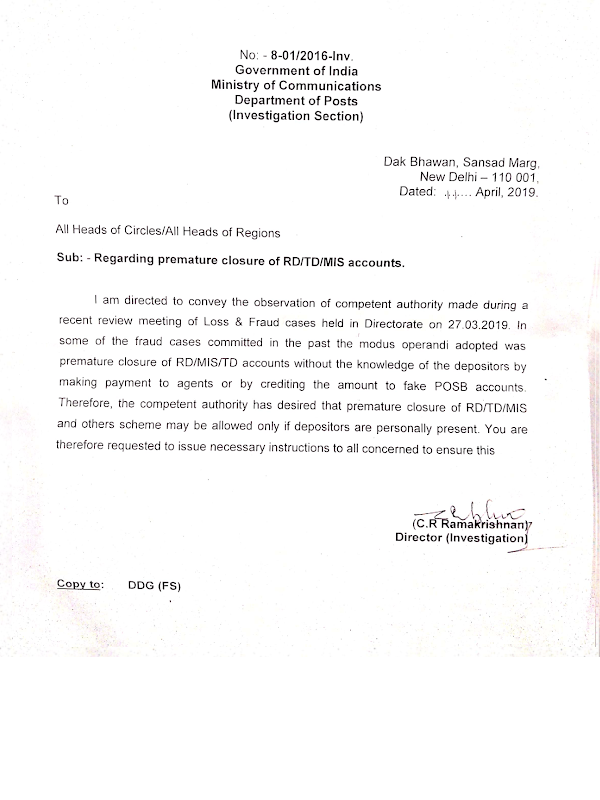 In some of the fraud cases committed in the past the modus oerandi adopted was premature closure of RD/MIS/TD accounts without the knowledge of the depositors by making payment to agents or by crediting the account to fake POSB accounts. Therefore, the competent authority has desired that premature closure of RD/TD/MIS and others scheme may be allowed only if depositors are personally present. You are therefore requested to issue necessary instructions to all concerned to ensure this.